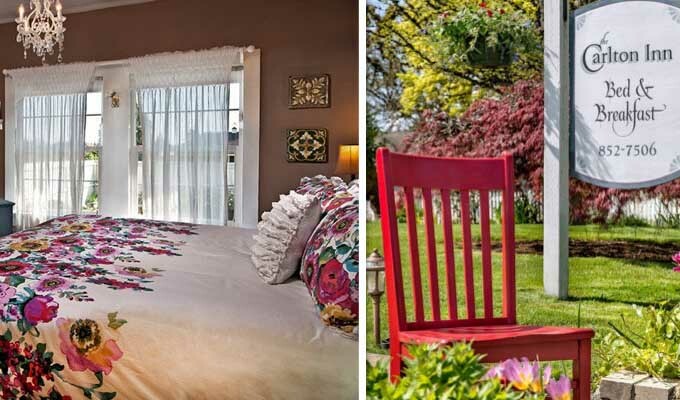 Each spacious room in the Allison Inn includes a charming reading nook, a bespoke table crafted from Oregon walnut, and a terrace or balcony view of the orchards and town of Newburg. Enjoy a state-of-the-art spa complete with an indoor pool, computerized weight-training system, and a treatment room for full-body hydromassages. 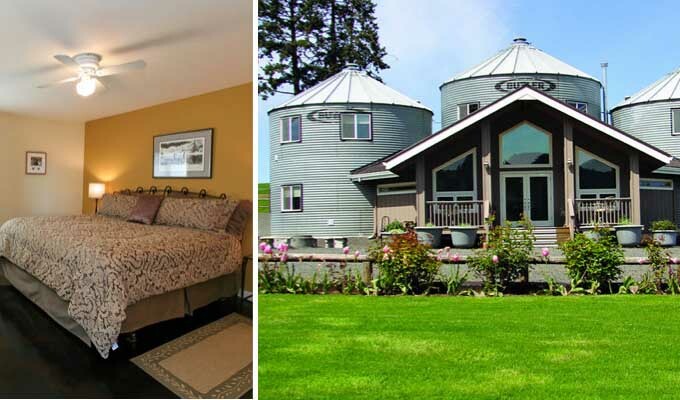 Set inside three converted grain silos, this rustic bed & breakfast and event center offers guesthouses overlooking a vista of vineyards and farmland. Each of the five quaint, individually-styled rooms come decorated with floral fabrics and wicker furnishings. Breakfast is served indoors or on a shaded patio, and guests can enjoy a tour of the working farm. Take a short drive to almost a dozen nearby wineries or spend the afternoon touring the owner’s flower and vegetable gardens. Visitors to the Carlton Inn enjoy the visual treat of color, art, and decor in the four quaint and cheerful guest rooms. You’re welcome to fresh-baked cookies upon check-in and a multi-course gourmet breakfast prepared from scratch every day. Once you’re ready to venture off the property, the Inn is in walking distance to half a dozen local tasting rooms. Please note: The Carlton Inn is an adult destination (no children under 12) and no pets allowed. 28700 NE Mountain Top Rd. with local grape tomatoes. After fueling up on breakfast, you can spend your day tasting at more than 10 wineries found in the area. The Grand Hotel, with 193 comfortable guest rooms and premier suites, is the first lodging establishment in Salem and Marion County to be EarthWISE-certified, recognizing the hotel and Bentley’s Grill for their commitment to environmentally friendly practices. Located in historic downtown Salem check out their Oregon wine tour packages throughout the Willamette Valley. In addition to guest rooms and meeting rooms, the Inn at Red Hills features four on-site tasting rooms with an extensive wine list from Dundee, the Willamette Valley, and beyond. Guests dining at the popular Babica Hen Cafe enjoy fresh seasonal produce from the adjacent garden, as well as morning eggs straight from the Inn’s small flock of chickens. The Joseph Mattey House is an 1892 Queen Anne Victorian set on 10 acres, framed by an onsite vineyard and stately cedars. Visitors can revel in authentic European hospitality, courtesy of the British owners, along with full breakfasts made from local produce and fruit from the bed & breakfast’s orchard. Inside the guest rooms at McMenamins Grand Lodge, you’ll find whimsical artwork, original porcelain sinks, and plush cotton bathrobes. The Grand Lodge is ideally located in the vibrant McMenamins neighborhood, complete with movie theaters, concert venues, and pubs offering handcrafted wine, beer, cider, and coffee. While rooms do not come with air conditioning, the quirky decor and walkable location attracts visitors. 10660 Southwest Youngberg Hill Rd. While staying at one of the Inn’s four king suites and four queen guest rooms, visitors can leisurely explore the 22-year-old organic vineyard and taste the estate’s award-winning wines. The entire property is encircled by covered decks with sweeping views of the Coast Range, Mount Jefferson, Mount Hood, and the Willamette Valley. 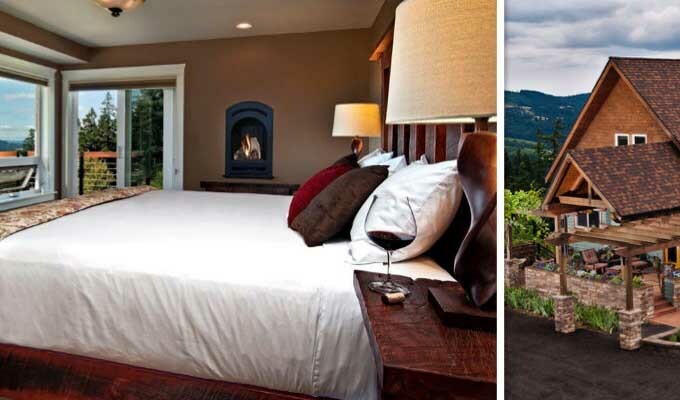 There’s even more great lodging, restaurants, and wineries to choose from when you visit Oregon Wine Country. If you have a favorite from the list above, be sure to vote for your top pick below! 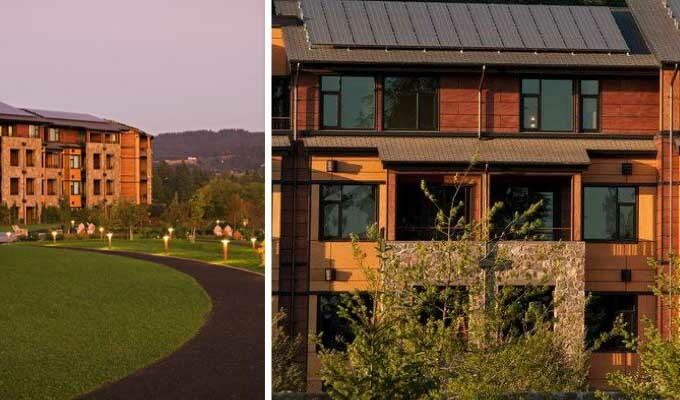 Which hotel has the best value in Oregon Wine Country?